The 7th Annual Girl's Night Out was held on May 4, 2018 at the Harrington Raceway & Casino Gold Room to raise funding for People's Place and the Chamber of Commerce for Greater Milford. The evening consisted of delicious tastings provided by local food vendors, music, contests, dancing, free photos, raffles and a Marvelous Chances auction. The highlight of the evening was the crowning of this year's Marvelous Man, which was awarded to Robert Carpenter from Dover Federal Credit Union. Each year the coveted title of Marvelous Man goes to the contestant who has raised the most funding for the two nonprofits. Through the efforts of the Girls Night Out Committee and the 2018 Marvelous Man contestants; Robert Carpenter, Anthony Zarello, Charles Jerome, Glenn Larson, Steven Mattson, and Alex Miller, this year's event was a huge success. 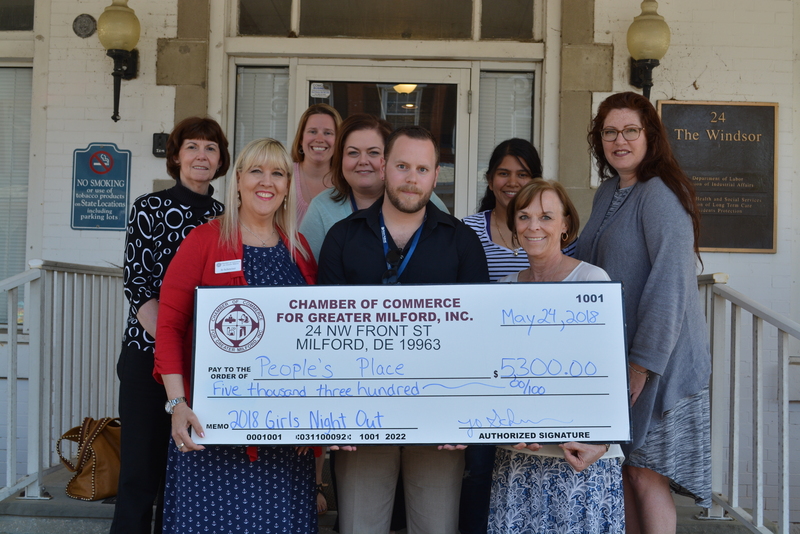 We would like to thank the Chamber of Commerce for Greater Milford for sharing the proceeds from the May 4th fundraiser and presenting the agency with a check in the amount of $5,300 to support the services we provide to Delawareans in need.